- 【HD Colour Screen】HD 1.96" TFT OLED colour screen, give you a new mood and bring you a colourful world. 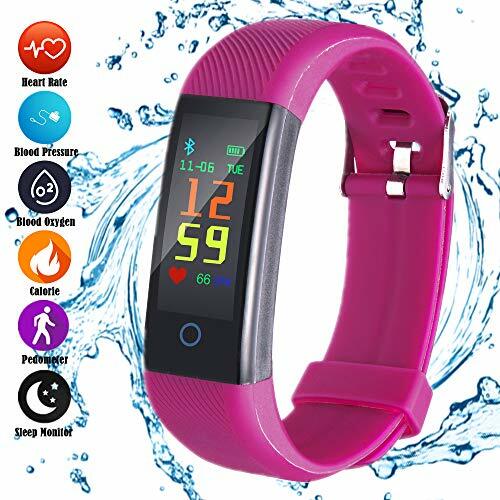 - 【Multi-Function】heart rate/blood pressure monitor, steps/calorie counter, distance counter, call/message reminder, sleep/sedentary reminder, alarm, remote shutter, anti-lost. - 【Built-in USB plug】This tracker watch adopts built-in USB plug, not charging cable need. You don't need to afraid lost charging cable any more. - 【Replaceable Strap】Replaceable strap design, let this tracker can company you longer, besides, you can let this tracker with the strap you like. - 【Wide Compatibility】This fitness tracker can fit smartphone with IOS 9.0 and Android 4.4 or above. Please install the App 'Lefun Health' in your phone and pair the device from it.